The picture shows the three different scopes used by a gastroenterologist. The first two scopes – EGD and Colonoscope are the scopes most commonly used by me in our practice. They are used to perform the upper and lower Endoscopy (Colonoscopy). While the ERCP scope is used to access the bile or pancreatic duct. The procedure is performed in the hospital setting. 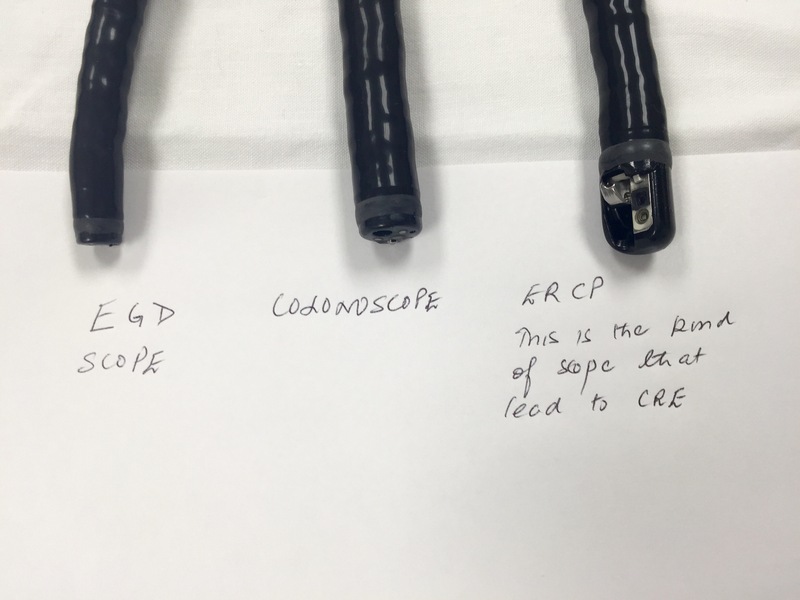 The picture clearly shows the first two scopes have a flat surface compare to the jagged surface of the complex ERCP scope. In the recently published studies, the CRE infection was supposedly transmitted by the ERCP scope. The first two scopes have not been shown to transmit infection. I want to allay any fear among patients who are planning to undergo routine procedures – upper and Colonoscopy. These are 100% safe procedures and do not pose any health risk to you. In the next blog I will upload a video showing the different kind of scopes.